Everest, highest mountain in the world: 8,848 meters. Ice kachang, sweetest mound in the world: 20 centimeters. We like to be dramatic about our tropical humidity here in Singapore. Instead of just a cold beer, we dunk ice cubes into our mugs of lager. 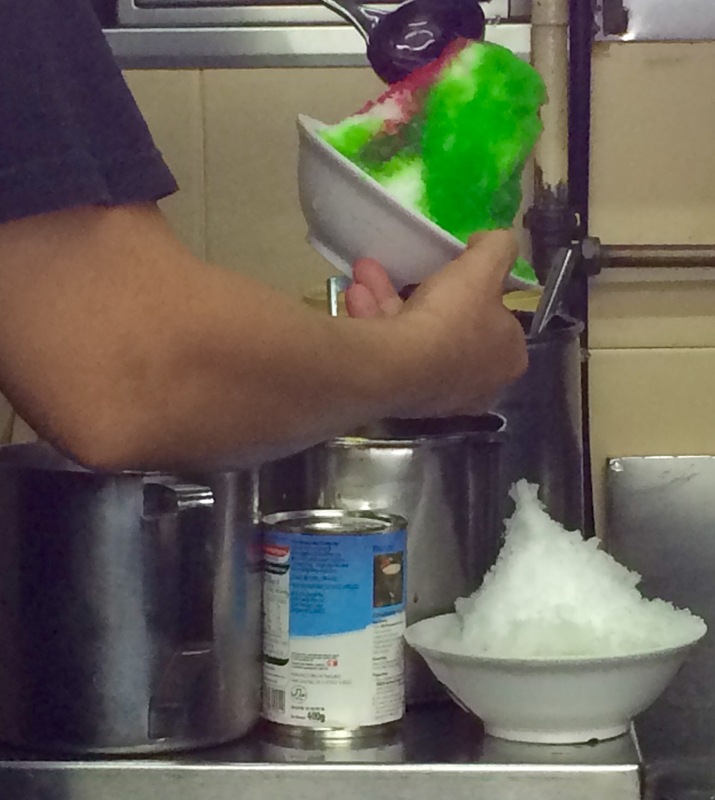 Instead of just a boring sno-cone, we fill it with Southeast Asian treats then crown it with everything from sweet creamed corn, soursop or honeyed sea coconut to durian, aloe vera or ice cream. This is way more than just a cherry on top. These hedonistic heaps are our signature year-round cooler, a comestible AC for the soul. It did not require brain surgery to dream up these psychedelic trips, just necessity being the mother of ice machination. In the 1950s and 1960s, pushcart drink peddlers hand-chipped ice balls drizzled with gula melaka (brown palm sugar) or rose syrup as an income supplement. The more adroit street sculptors were able to get the ice down to featherweight texture so each bit dissolved upon the tongue after just the slightest fluttering dance on the tastebuds. The advent of manually operated ice machines meant that vendors had to develop a sleight of hand skill in steadying a block of ice while cranking the shaving mechanism with the other, kind of like a master barber on crack. Now that the machines are automated, the challenge lies in forming a perfect cone each go. And many ice kachang (Malay for “nut;” within the context of the dessert it refers to the red beans) hawkers are all about outdoing each other with outrageous ingredient and topping combinations. The pièce de résistance at Tiong Bahru Market’s Liang Liang Garden Dessert stall is the Milo Dinosaur ice kachang, a riff on the popular local drink that smothers the summit with its namesake chocolate malt powder. Me, I customize. I keep it simple, so from the outside, it looks as basic as ice kachang can be – just gula melaka and evaporated milk snaking down from the peak. Inside, instead of kachang, it’s ingredients from cheng teng, another local treat to beat the heat with. I go up to my favorite dessert stall at East Coast Lagoon Village and say, “My usual, please.” And it’s all cool. P/S: The tallest ice kachang ever built in Singapore happened on July 22, 2006 in Chinatown – it’s in the Guinness Book Of World Records. 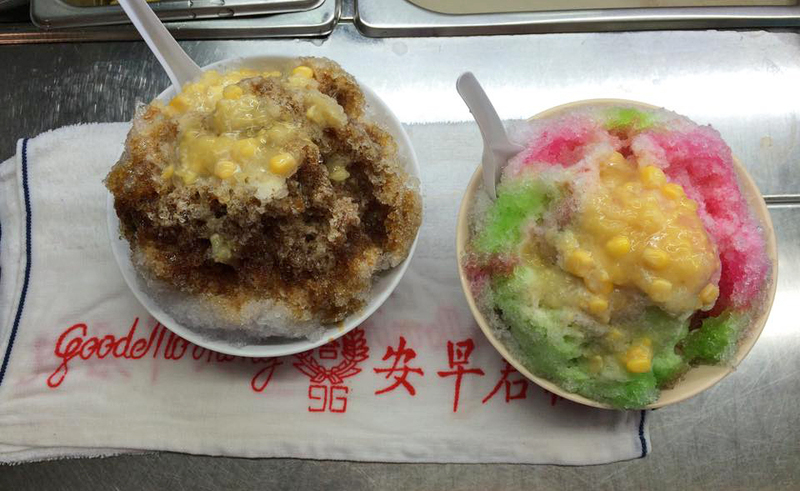 Ice kachang is one of our commemorative SG50 icons. This entry was posted in Food, Singapore and tagged #hawkercentre, #heritagefood, #icekachang, #oldairport, #sg50, #shavedice, #streetfood, dessert by Desiree. Bookmark the permalink. Hello, CW! You are so nice to comment – thank you for your kind words! It’s fun to both eat and verbalize what we eat. I appreciate your stopping by!